I literally cannot believe tomorrow is September 1st. Where has the year gone?!?! Next question: is there anything more versatile than denim? You wear it year-round, it can be dressed down or up for nearly any occasion, and it can be paired with any color of the rainbow. 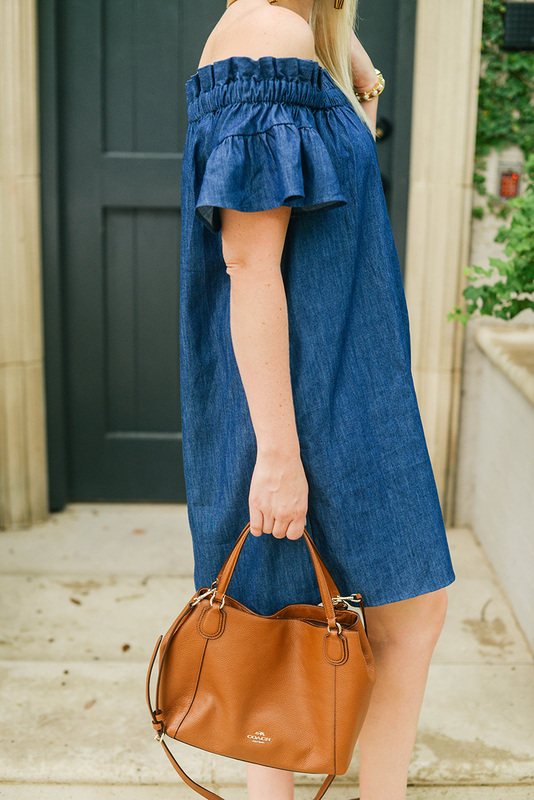 When I saw this dark denim off-the-shoulder dress, I figured it would be perfect for these first few months of “fall” here in Texas – I use quotes, because we all know it’ll be in the 90’s through October. It’s a breathable style for the heat, but the color looks amazing with my favorite fall neutral accessories! The ideal combo for Texas in September and October, don’t you think? While I definitely wouldn’t recommend wear it solo (it’s a little too flashy for my taste), I think this dress would look so chic layered over a button-down or turtleneck – sort of like a pinafore dress. You feel me? For a legit pinafore dress, try this one from 7 or this Topshop number. LOVE the giant pockets on this flattering button-up denim skirt by Vince Camuto. Too cute! This CO dress is on sale for $165 down from $550!! If you haven’t heard of this brand before, get acquainted. It’s one of my current favorites – I have so many pieces on my wish list! The sweater I featured here is one of them. If you’re looking for something with sleeves, try this dress or this tie-sleeve Tibi number! The waist-cinching belt and fit-and-flare look of this dress makes it the most flattering of the bunch. A little trendy, but super fun! Love that dress the color is perfect indeed. Anthro always have the cutest stuff. Seriously though–HOW is August over? 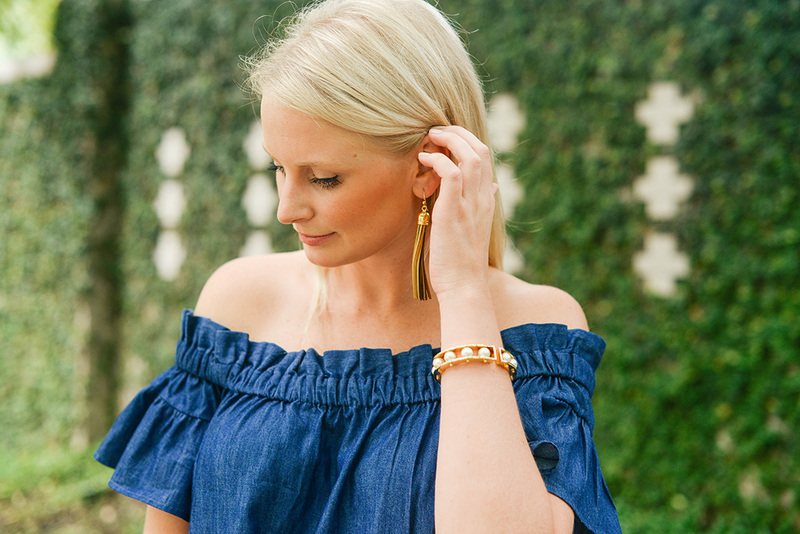 Love the gold tassels…your sister is killin’ it with those earrings!! That dark denim dress is definitely perfect!! Nice cut and colour! I love it. Nice choice! So cute! I love this on you! This looks like a dress I could live in, year round! So cute!! And seriously, this year is flying by! Denim is definitely the most versatile fabric! Loving your dress, so chic and cute at the same time! i cannot believe it either!!! I’m buying this dress today! How crazy is that?! Summer flew by! Gorgeous look babe. This is such a great dress. I love the details on those sleeves. Also, I love it paired with the cognac accessories. Love this dress and that bracelet, so cool! I’m with you, haha, I swear it was just January! Texas really knows no other season besides summer – haha! I love this dress on you!